Michael Giacchino has lately proved to be a very versatile composer with a large range of music. 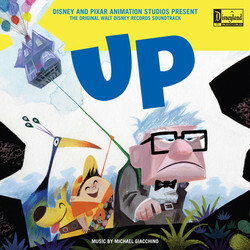 His newest score to the Disney-Pixar film UP is, in my opinion, one of the best scores for an animated film. I would even say it tops his own score from The Incredibles. After watching the film I realized that Michael Giacchino had just become one of my favorite composers. The album starts off with "Up With Titles", a fun little cue that is reminiscient of the old news reels that were featured in the 30's. The track itself feels like it borrows inspiration from Toy Story with it's lighthearted tone. (This is later repeated in the track "The Spirit Of Adventure") Following the opening track is "We're In The Club Now". This cue is a soft, melodic track that familiarizes the listener to the main theme. The main theme also makes a very nice reprise in "Married Life", a cue that is surprisingly sad. Michael Giacchino does a great job of alternating between a lighthearted score and a sad feel. "Married Life" does a great job playing up the emotions of the score and is complimented by the following cue, "Carl Goes Up". The track gives the listener the feeling he is rising upwards. Giacchino plays out a more magical feel as he uses numerous variations of the main theme coupled with a mellow sound. 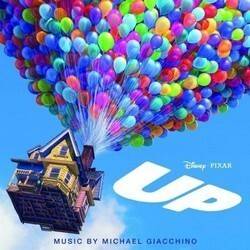 As the album picks up (no pun intended) Giacchino pacens it nicely with the thrilling cue "52 Chachki Pickup". He aims for a more thrilling feel that definitely creates good variation on the album. The following cues, "Paradise Found" and "Walking The House" are easier on the ears and work great as more background music and even introduce a few new themes for Paradise Falls. This is also repeated in "Kevin Beak'N'". The two tracks, "Three Dog Dash" and "Canine Conundrum" bring back a more fast paced score with multiple hints of jungle drums and horns that really compliment the sound quality of the album. They even manage to pick up a bit of tension in the score. Continuing on is "The Nickel Tour", a cue that re-introduces the explorer theme first heard in "Up with Titles". In "Explorer Motel" The cue reappears, only in a more dark and twisted form which continues on with "Escape From Muntz Mountain", another fast paced action cue. The next track, "Giving Muntz The Bird" (a nice bit of subtle humour in the title) starts off with a fun variation of the main theme and ends off with a dark twist. The third part of the album is opened with the melancholy "Stuff We Did". To be honest, it is hard to listen to the track without feeling sad. Giacchino does a great job with utilizing the piano to create such an emotional cue. The following cue, "Memories Can Weigh You Down" is my favorite track on the album. It is basically a heroic twist on the main theme. Giacchino borrows a similar tempo from some of his other scores and ultimately creates an adventerous feel. The album really speeds up with "Small Mailman Returns", "He's Got The Bird" and "Seizing The Spirit Of Adventure", three cues that show how well Giacchino can create an action tempo for an animated film and still stick with all of the themes he has created before. Each theme clashes with each other as the score feels like it is playing tug of war. After the dust settles Giacchino returns back to the main theme with "It's Just A House", a nice cue that starts very soft and ultimately ends with a grand, brassy version of the main theme itself. "The Ellie Badge" also continues and even brings back the soft piano solo that feels perfect on it's track. The final piece, "Up With End Credits" is a collection of all the themes you have heard before. Giacchino employs this with every film he does and it still works flawlessly. An additional track, "The Spirit Of Adventure" is a nice song that adds lyrics to the explorer cue. This album, being only available as a download on iTunes, features a small selection of audio bits provided by Skywalker Sound as a bonus. Unfortunately these little clips don't add anything of real value to the album they are presented on. My other complaint is the fact that the album can only be found online. It is a real shame but still holds up as the best animated score so far. Michael Giacchino has proved to be the next John Williams as he can carry a catchy and exciting tune without resorting to tired cliches or just sound in general. Hopefully we will get to see more scores like this in the future.